Wade, Much food for thought. I am not sure I agree with it all, as you said, this I do 100% agree with and humble my heart before its truth. "Christianity is not the same thing as American politics, but it may be that what has caused the decline of our republic is the loss of true Christian character of her people." I'm all for a strong military, (in rereading the article, I realized it might not sound like it), but a strong armed forces should be used for our national defense, not interventionism (similar to Switzerland's policy and ability to remain neutral). "(1). America ought to withdraw from wars around the globe and let Europe, Africa and other continents fight it out. There will always be wars among us; but unless our national security is at stake, we should not fight other peoples' wars for them." This will be a problem, considering we start these wars. Inciting violence around the globe keeps the military industrial complex in business, and boasting of being a 'superpower' keep the sheep cheering for more of the same. "USA! USA!" ad nauseum. "(4). America should get it's fiscal house in order, removing any politician who approves spending more than our country receives in taxes." Big problem with this one; Our manufacturing has moved to China for the slave wages, leaving us with minimum wage jobs. No living wage means no taxes, and without borrowing, this house of cards goes down. "While it may be impossible for me to change your mind about Christianity and America, it may not be too late to convince you that what America needs is a great revival of true religion." Read the back of the book, Wade. We are in the great falling away. The end of time, if you haven't been paying attention. Hey wait, you're a preacher. You should not only know this stuff, but be yelling it from the pulpit. 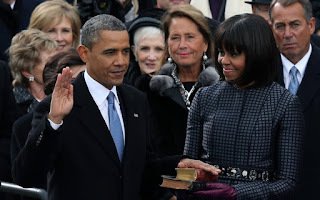 However no prayers at the oath taking ceremony before Franklin Roosevelt in 1937 (though there might have been separate prayer services that might or might not be attended by the President/President elect [evidence is lacking of this for many of the inaugurations other than 1933 and 1789]). Roosevelt always had both a Catholic priest and a Protestant minister. Truman added a rabbi. Eisenhower added an Orthodox priest. Recent presidents have had only one or sometime two Protestant minister at the actual ceremony and a more interfaith service at some other time. "The Citizens of the United States of America have a right to applaud themselves for having given to mankind examples of an enlarged and liberal policy: a policy worthy of imitation. All possess alike liberty of conscience and immunities of citizenship It is now no more that toleration is spoken of, as if it was by the indulgence of one class of people, that another enjoyed the exercise of their inherent natural rights." Jews and all others were to possess alike with Christians liberty of conscience. At least according to Washington. Certainly some at that time wanted a Christian state tolerating other religions, but, others felt otherwise and explicitly included non-Christians among those to have unqualified admission along with Christians. No argument from me for the full participation of people from all faiths in the liberties all Americans enjoy. My point is that Jews, atheists, Buddhists, and Muslims should never be offended that prayers in the United States government are prayed "In the Name of Jesus Christ." The liberties we enjoy are at the foundation of the Christian religion. Wade, We would love to see your great articles on www.CollectiveFaith.com. Please join and share with our Christian Social Network. Unitarian understanding of Christianity. How does that effect your point? Joseph Story's advocacy for the principles of life, liberty and freedom were based on his understanding of the teachings of Jesus, regardless of his view's on Jesus' divinity. He considered Christianity THE religion upon which the principles of the Republic were founded - not Buddhism, Hinduism, Islam or any other ism. I believe if we had not fought Hitler in Germany we would fought him in America...the same with ISIS. Roosevelt said "Walk softly but carry a big stick." Obama caries a toothpick. 1) I agree that we are far too involved in the Middle East and that we should withdraw. But on the other hand, our troops in Europe are keeping Russia from swallowing up Ukraine, and our troops in South Korea are a major deterrent to North Korea. I think that instead, we should ask ourselves before sending troops anywhere, "Will this action promote peace, or merely stir up more trouble? 2) If non-Christians are coming to the US, this is a tremendous opportunity for evangelism. Instead of turning them away, we should embrace the opportunity that God has given us to reach these people. If we win even a few of these people to the Lord, they will have amazing opportunities to return to their home countries with the Gospels. And if our church structures or our political views are preventing us from maxing out on this great opportunity, then we need to rethink how we do both. 3) I agree, but we also need to do a better job of controlling what American companies export. A lot of the wars in the Middle East are being fought with privately purchased American small arms and munitions. 4) In theory, this makes sense. In practice, the government can and should act as a counterbalance to the economy. When the economy is going well, the government should cut spending so that the economy doesn't grow too fast and implode. When the economy is doing poorly, the government should act as a stimulus. There's also a difference between good debt and bad dept. Spending money on infrastructure makes sense, even if it requires some debt (within reason), just like it's cheaper in the long run to go into debt and buy a modest house than to pay rent all the time. Spending money on frivoulous tax cuts, entitlement expansions, an overly-large military, etc is bad debt and should be avoided regardless of the government's overall debt limit.